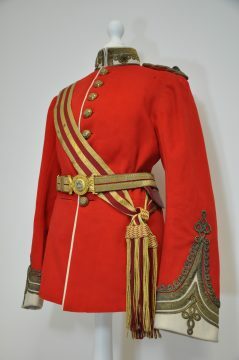 Thanks to generous public donations last year in the centre Hayle Heritage Centre has been able to buy a Victorian Officers full dress tunic belonging to Lieutenant Colonel Harvey of the 2nd battalion DCLI. Lieutenant Colonel Harvey was one of the Harvey’s of Hayle a family renowned for engineering expertise. The Harvey family built up a foundry and engineering empire in the town that was known and respected round the world (they built the biggest steam engines ever built) and Hayle Heritage Centre is based in the old Harvey’s Foundry Offices. We have very few personal items relating to the Harvey family and named clothes are extremely rare. This item is not only beautiful but it has full provenance that proves it belonged by Lieutenant Colonel Harvey. Due to generous public donations in the centre last year we have been able to buy the tunic when it came up for auction. The uniform does need some conservation work but will be on display in the heritage centre when the centre re-opens to the public on the 12th of April (11-4). The centre has had a re-hang over winter with lots more artefacts on display and new exhibitions. We are celebrating our new look with a coffee and cake morning on the 12th and a family friendly craft workshop in the afternoon. We are also going to be open on Saturday the 15th of April with free craft activities for children and a Easter Egg hunt from 11-3. For more information about Hayle heritage centre visit our website hayleheritagecentre.org.uk, you can also follow us on facebook Hayle heritage centre and on twitter @hayleheritage. Or call us 01736 757683.